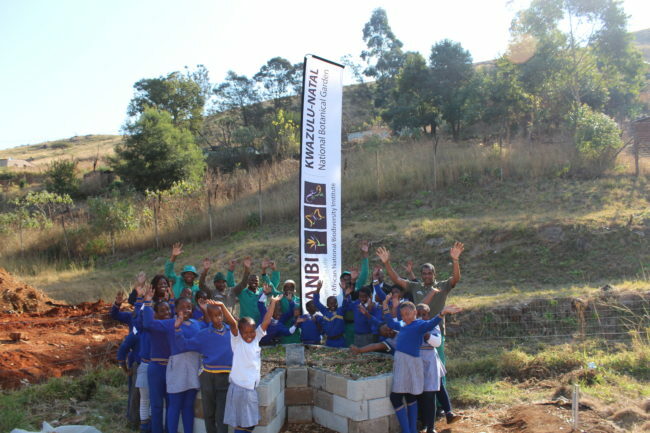 In commemoration of Mandela day, SANBI’s KwaZulu-Natal National Botanical Garden (KZN NBG) staff visited Imbubu Primary School in Sweetwaters village. 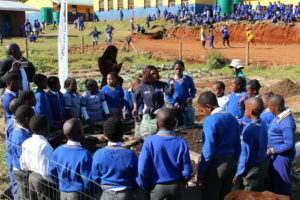 They spent 67+ minutes of Mandela day teaching learners about food security and permaculture gardening, and also donated a key hole garden. A keyhole garden is a raised-bed planter. It is often built in the shape of a circle that stands waist-high and is notched like a pie with a slice cut away. A hole in the centre holds a composting basket that moistens and nourishes the soil, this garden type is one of many horticultural practices that contribute towards sustainable gardening. This sustainable gardening method uses kitchen and garden waste and grey water (or wash water) as food for your garden. The keyhole garden is made out of mostly recyclable material, promoting environmental sustainability and food security with the use of a permaculture garden (your common vegetables and herbs). The seedlings planted in the keyhole garden were donated by Sunshine Seedlings. 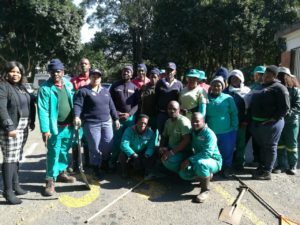 Some of our KZN NBG staff members also cleaned up Zwartkop road and helped with gardening and weeding at the Prestbury police station. The staff was having fun while they were hard at work at both venues, all the while reminding each other of the sacrifices that Tata Madiba made for his beloved country. Cheerful songs were sung to celebrate the life of Tata Madiba, the father of our nation.